I'm not going to lie, in addition to laying in a warm pile of laundry and eating bread & having a dance party with Ellen, being a personal shopper has definitely occupied my daydreams once or twice. 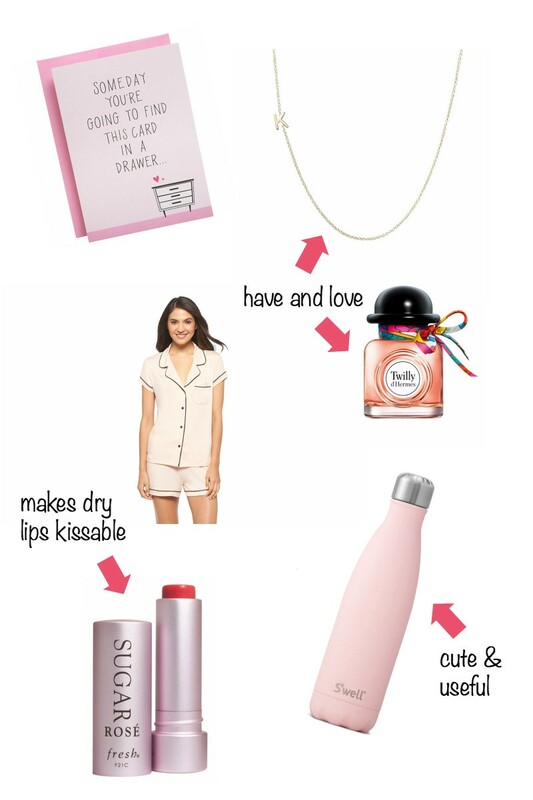 ;) I love choosing things I think would make great gifts for different occasions, so I thought I'd put together a Valentine's Day Gift Guide for women, men, and kids. Today is for the ladies! I have the necklace, perfume, and water bottle and love all three. The PJs look so soft and comfortable (can you ever have too many pairs of pajamas? ), the lip treatment is perfect for dry winter months, and I just thought that card was so cute because it's true (#cardhoarder). Check back next week if you'd like for a few ideas for the man in your life, and the following week for some ideas for your littlest valentines! I'm glad you like them! I do think the pale pink is a bit more timeless than the brighter shades -- that way, each gift is useful long past Valentine's Day. :) Thanks for stopping by! The Fresh lip balm is seriously the best thing ever!! And SO necessary for winter! Thanks for visiting!